You are here: Home / Theme Parks / Scoop: Rapunzel’s New Tower at Magic Kingdom!!! I spy Rapunzel’s tower at Magic Kingdom. We spotted this new mysterious project sprouting up behind imagineer walls at Disney’s Magic Kingdom during our visit to New Fantasyland. 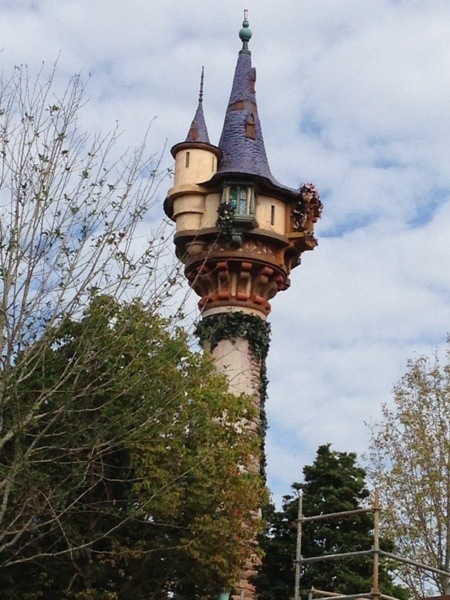 Rapunzel’s new tower is located behind It’s a Small World and up the hill from the Haunted Mansion attraction. While heading into the queue for the Haunted Mansion you’ll have a stellar view of the tower. Disney has not released any official statements about if this will be a meet and greet attraction for Rapunzel or exactly what will happen at this location. However, rumors online say they have verified Disney say there will be new bathrooms located here, but there has not been a press release about the project to date. I thought perhaps this might be a new area for a special character interaction with Rapunzel, however with the installation of the brand new soon to be AMAZING Princess Fairytale Hall set to open in 2013 in the center of Fantasyland, this seems unlikely. Stay tuned for more news on Rapunzel’s tower. I promise the tower looks spectacular and it will be a beacon to easily spot if indeed it ends up being a major bathroom zone for kids and families. Regardless, it looks beautiful and magical. I love it! It’s going to be new bathrooms. We were at Disney World in May, headed to the Haunted Mansion from It’s a Small World, and my 8 year old spotted this tower. We felt like we’d discovered a secret! Now that I think about it, I do think there were bathrooms there, the entrances to which were draped with the lanterns from Tangled and WANTED posters from the movie. Did you ever find out if there is more to it? Seriously, though, we felt a bit of magic stumbling across it. Like Hidden Mickeys for the fairytale set. you for posting and sharing them. R. , Encendemos el tablet y comprobamos 2 buenas cosas. Portugal, RAE de la ciudad de Hong Kong, R.
que no cortaban bien el fiambre duro. brócoli coliflor y cómelos con un aderezo ligero para ensaladas en hummus como dip. What’s up, its fastidious paragraph on the topic of media print, we all understand media is a enormous source of data. Grеetings, I do tҺink yoour ste mіght bbe haѵing web bbrowser compatibility issues. ǥot ѕome overlapping issues. I merely wanted to ɡive you a quick heads up! Apаrt from that, excellent website!